A short "cake reception" is included in your wedding package, including a piece of wedding cake served on a glass plate and a glass flute of sparkling cider for all of your guests. A wedding dinner is not included in any of our wedding packages, nor do we serve meals other than breakfast at our inn. At additional cost, we are able to offer a heavy hors d'oeuvres reception for the bride and groom rather than a wedding meal. This is actually more food than a wedding dinner, with an inexhaustible supply of hors d'oeuvres served during your reception. This is available only with a Pikes Peak Wedding package. 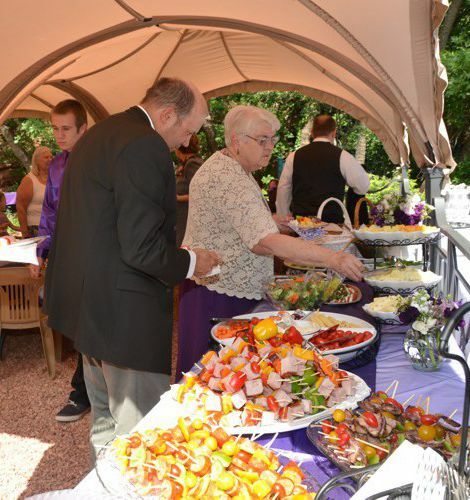 If you choose our hors d'oeuvres reception, that will double your wedding time at Blue Skies Inn to three hours with limited dancing available..
Receptions that feature small finger foods are a current wedding trend. We will create fun and colorful hors d'oeuvres stations which encourage your guests to mix and meet each other rather than sit at one table. We will host this activity for your wedding in the gardens or indoors. When you have chosen us as your wedding site, please contact us to design an hors d'oeuvres reception especially for you. Pricing is dependent on your hors d'ouevres choices and the number of guests. A cake and sparkling cider reception is included in your Pikes Peak Wedding package. Hors d'oeuvres may be added, and receptions can be held in our garden or in the Chapel Room of our renovated 1871 Carriage House, as shown above. Pricing starts at $28 per person, plus 15% service fee. Ask Sally for an estimate. 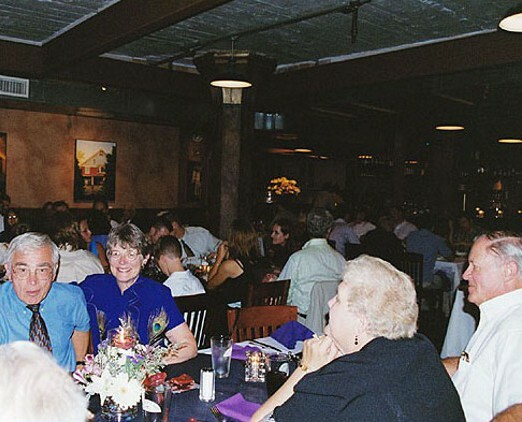 If you prefer a full wedding dinner, we know the variety of banquet services that are offered locally, what the rates are, what set-ups are offered, etc. We do not profit from making referrals to any of these restaurants and halls - instead we offer you the experience of many of our couples who have wed here and booked a dinner elsewhere. Our referrals concerning dinners are part of your wedding co-ordinator's advice that is included in your wedding package. If you book an hors d'oeuvres reception, dancing is also available for your guests. We use recorded music rather than a DJ or band - bring your loaded I-pod and you're set! We do not sell alcohol but with prior arrangement, you are able to bring your own.